Reproduced from Hay, G., (2005), Hungary Paperclay, Pyre Newsletter, Ceramic Art Association of Western Australia, Dec/Jan, 14-16 (with Editorial permission via email: Wednesday, 14 December 2005 7:47 AM.) Some modification of the layout has been made to improve viewing on the internet and to provide links to information sites. More articles on paperclay here, and by the author here. Graham Hay describes the origin and events at Firing Fibres, the first international paperclay symposium at the International Ceramic Studio, in Hungary. In April 2003 Steve Mattison, Residencies and International Contact at the International Ceramic Studio in Kecskemet (Hungary), emailed_me with the idea of hosting the first international paper clay symposium. I provided contacts of possible guest artists, and we agreed it be held in August 2004. We were successful in attracting another paper clay pioneer, author and USA patient holder Rosette Gault as the other Guest Artist. Unfortunately New Zealand based pioneer Brian Gartside was unable to attend. In the end 19 people from 12 countries were to come. 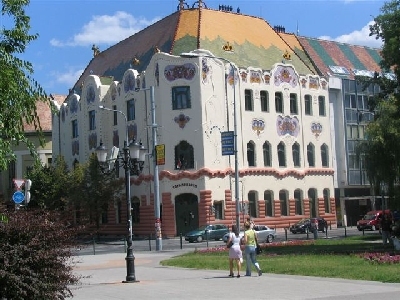 The studio is a 5 minute walk from the middle of KecskemÈt, a modern town with some outstanding historical buildings. The International Ceramic Studio, at KecskemÈt in Hungary, contains accommodation and self catering facilities, studio spaces, a library, a Gallery and Museum, Lecture theatre, and over 18 kilns. Symposiums are a common way for European artists and educators to share techniques and knowledge. Often the international symposiums run for a month, over their summer holiday and provide a great way to learn, conduct studio research and met artists from geographically diverse countries. 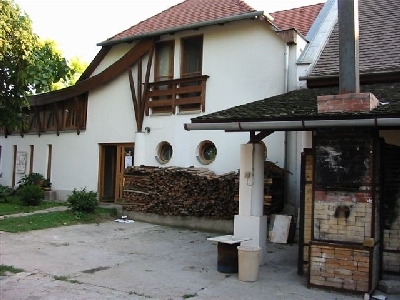 The International Ceramic Studio is located centrally in KecskemÈt, eighty kilometres south of Budapest, Hungary. It has been running ceramic symposiums all year round for 28 years and has fantastic facilities with over 15 different sizes and types of kilns with dedicated glaze making and firing support staff. The relaxed environment and on site accommodation allows for intense periods of creativity free from the distractions of everyday pressures. The Studio has a concurrent residency programme for those working independently to creating works, experiment with and research new and different ways of making. Those who stayed more than a month are also able to tap into one or more symposiums. The result was that at any one time there could be over 30 ceramic artists working and socialising at the Studio symposium and residencies. Over the years the Studio has acquired an impressive collection of over 3000 ceramic artworks from 268 artists and 35 countries. We spent a full day just exploring, photographing, handling and discussing these work, which illustrated every possible ceramic technique and idea. For this Symposium there were 19 people from 12 countries living and worked on site 24/7 for 3 weeks at the Studio. We gave formal and informal demonstrations on making and using paperclay to each other, as well as at a Association of Hungarian Ceramists Open Day. See www.grahamhay.com.au/icsinvite.html for links to artists' websites and the Studio's website which now has over a hundred images from the symposium. On most evenings there were slide or digital presentations by myself and Rosette, symposium participations, resident artists and local artists to stimulate new studio ideas and discussion. As well as showing my own work I was able to presented images of paperclay work from Australia and elsewhere. I presented images of paperclay work by Australian artists Louise Boscacci, Barbara Campbell-Allen, Jeanette Wing Chow (WA), Sally Colpoys, Frances Dennis (WA), Steve Harrison, Alyson Hayes (WA), Dee Jaeger (WA), Mike Kusnik (WA), Robyn Lees (WA), Nicole Lister, Helen Manson (WA), Angela Mellor (WA), Lilach Mileikowski, Andy Miller (WA), Evelyn Parkin, Irene Poulton (WA), Jessiac Spaven (WA), Vipoo Srivilasa, Gaye Stevens, Elizabeth Timmins, and Wendy Windfield (WA). A wine and gypsy music festival 5 minutes walk into the centre of Kecskemet, provided a connivent introduction to Hungarian foods, wine and music. The Studio also organised a bus to Budapest for the national day (20 August) celebrations which included over 500 Hungarian craft stalls, their crazy stunt pilots and a 11 km long fireworks show that night! As well as a welcoming banquet and a traditional Hungarian Goulash on the Open Day, we feasted at various local restaurants. 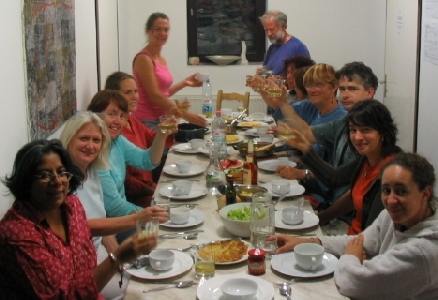 At other times the Symposium participants and other studio artists pooled food from the nearby and inexpensive Farmersí Markets, to create multicultural feasts in the studioís communal kitchens. At the end of the three weeks there was a number of informal discussion groups that led into a one day forum where all work created was displayed, with individual discoveries, successes and failures discussed. These were summarised into notes on the symposium organisation, the advantages and disadvantages of paperclay, its affects on clay bodies and artistic expression, the different techniques used and their impact on timing, types of fibre available and their affects on the clay and techniques. Broader issues surrounding paperclay, its position within the pottery and ceramic art traditions, issues of occupational health and safety, environmental issues, the types of people attracted to paperclay, ways of teaching paperclay, the public and fellow artistsí perceptions of paperclay, had been discussed in informal discussion groups. At the conclusion of the symposium there was an exhibition of selected works created over the three weeks, at the new onsite Museion and Gallery. Over 5600 images, 40 documents and 23 slideshows and presentations were collected from the 19-day symposium. I collated these into a CD and a copy was provided to each participant as well as each Australian artist who kindly lent me images of their paperclay work to show in Hungary and Singapore. After the symposium Graham spent a week in Budapest before flying to Singapore, Melbourne and Geelong to give further paperclay workshops to potters, papermakers and fibre artists respectively. Following on from this Graham helped organise a visit to WA by Singaporean potters in late 2004. More detailed technical and aesthetic questions raised at the first international paperclay symposium in Hungary are discussed in Paperclay Update Ceramic Technical (issue 22, 2006). Those interested in reading more about paperclay, including 35 journal articles, may visit www.grahamhay.com.au/paperclay.html. Reproduced from Hay, G., (2005), Hungary Paperclay, Pyre Newsletter, Ceramic Art Association of Western Australia, Dec/Jan, 14-16 (with Editorial permission via email: Wednesday, 14 December 2005 7:47 AM.) More articles on paperclay here, and by the author here. Some modification of the layout has been made to improve viewing on the internet and to provide links to information sites.